The other day, both my 6 year old and 5 year old wanted me to teach them how to knit. As I was contemplating on whether or not to teach them this craft, my thoughts flashed forward to a visual scene of "what if". I foresaw a chain of events that would eventually end with all of us in the emergency room and myself explaining to the ER doctor why I thought it would be a good idea to give my kids 10" knitting needles to craft with. I still wanted to do some sort of craft with my little ones. I have been told that as they grow older these moments will become few =(. I then remembered when I was a little girl my mom had taught me how to finger knit. I made all sorts of fun things like scarves, necklaces, and jump ropes. I decided to teach my kids this safe craft and it turned out to be a big hit. 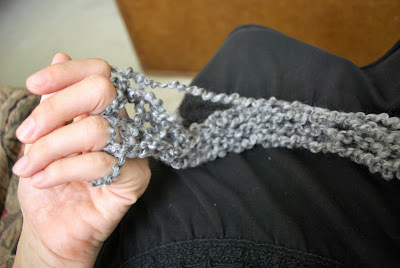 So, if you are interested, here is a tutorial on finger knitting. 1. 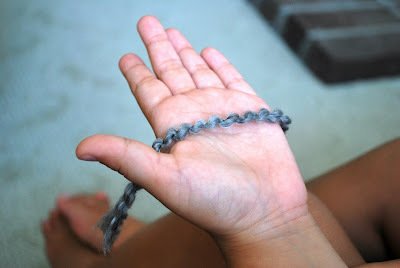 Lay a strand of yarn across your hand. I will refer to this strand as the tail. 2. 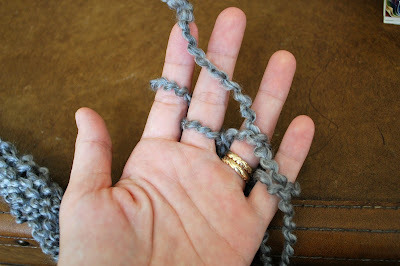 Weave the yarn that is attached to the skein around your fingers like the picture above. First going under the little finger, over the ring finger, under the middle finger, and over the pointer finger. 3. Now repeat the weaving, but go back towards your little finger. First go under the pointer finger, over the middle finger, under the ring finger, and over the little finger. 4. Wrap the yarn behind your hand, moving towards your thumb, wrap it up and around the fingers that you have already woven the yarn through. Looking at the picture above, you will have the tail section across the bottom of your hand, in the middle of your hand is yarn you have woven between your fingers, and at the top is the yarn you wrapped around your fingers. 5. 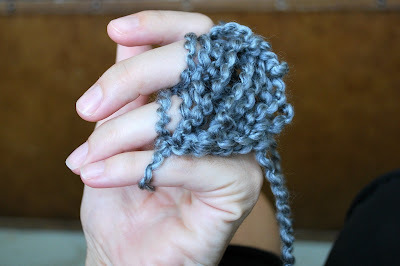 Starting with the little finger, take the bottom yarn (woven part, not tail) and pull it over the top yarn. 6. Your hand should look like the above picture. Repeat step 5 with the ring finger, middle finger, and lastly the pointer finger. 7. Your hand should look like the above picture when you have completed your first row. Notice the tail is now in the back. You can move it to the back whenever you want. 8. Continue to repeat step 4, step 5, and step 6 to the desired length. 9. Eventually, your yarn work will look like the above picture. Take the tail and pull it. This will tighten the yarn and give it shape. 10. 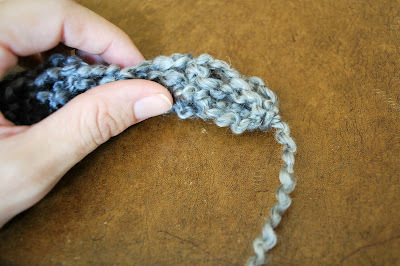 When you are satisfied with the length of your finger knit, cut the yarn that is attached to the skein. Be sure to leave about 5" of extra yarn. Now take the 5" of extra yarn and pull it through all of the finger loops. This will tie off or bind off the loops. 11. Your finished end should look like the above picture. 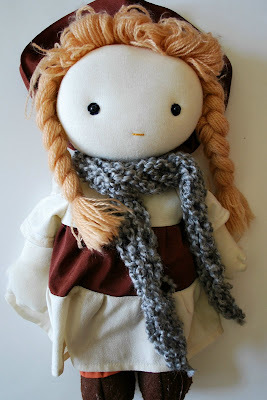 Now, our sweet little Holly Hobbie has a scarf to keep her warm in...er....uh...July??? I teach fingerknitting to my kindergarten class! Our method is slightly different. We do two figure eights and then lift the bottom over the top, instead of having the second "row" be a straight line across. My students like to experiment... after a while you can challenge your kids to do two strands together, to go from four fingers to three or two, etc. Big Fun! We made "bookmarks" as Chanukkah presents. We attached a bead to each end, voila, bookmark! My students went nuts with it. Some of them were quite competitive about it! Interesting! I will have to try your method out. Great idea for bookmarks. Would you consider doing another tutorial on single finger knitting and then making flowers out of them, if you know how. I tired following a video on the internet but it didn't work. Thanks for the great photos. Thanks Jamie for this tutorial. I emailed my sister your blog so she could also check out the finger knitting (she is a good knitter). I have never made a flower out of a single finger knit. I will have to look into it. If I feel confident enough, I will do a tutorial on it. I came from the Crafty Crow. This is a lovely tutorial! I have some little ones that will love this craft in about four years lol! These photos bring back childhood memories. My friends and I did this often...many times creating leis for us to wear while we danced the hula! Thank you for the great tutorial! I've taught my third graders, my own 6 and 4 year old this method. It's wonderful! This is the only kind of knitting I know how to do, LOL! I learned many years ago in Girl Scouts, and picked it up again a few summers ago as a way to decorate flip-flops. 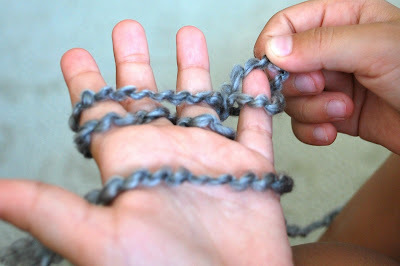 In fact, I am teaching my MOMS Club how to finger-knit Tuesday night for our MOMS Night Out. Thanks so much for putting up this clear tutorial. 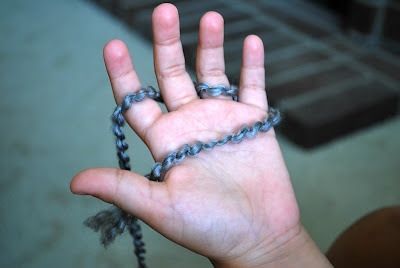 I just taught my daughter today to finger knit with one finger. Now I want to teach her with four :) I'm just making a blog post about it and will put up a link to your tutorial. This looks so awesome! I knit and everytime my three year old niece comes in my room and sees my knitting basket she wants totry it too. Just to be nice I hve tried to show her but she obviously has some trouble. Hehe. I saw that someone here taught their four year old this method. She will be four in a few moths and is a smart kid so maybe she can learn this? We will try and see. I live seeing kids discover new things!! Thank you for sharing this with us...my kids will LOVE it. And it will keep them busy for a while to boot! I think is awesome the way Finger Knitting can be used to create such pretty stuff like that scarf. I love crafts so thank for sharing this useful tip. I participated in a Craftanoon at the National Gallery of Australia on the weekend and learnt how to finger knit. 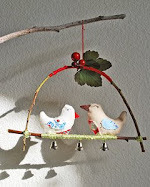 I thought it was so much fun that I was looking for a tutorial on the web to put a link in my blog and would like to include a link to your blog - I hope thats ok with you? Yes, as your kids grow older, the chances of them wanting to do stuff with you gets more unlikely. 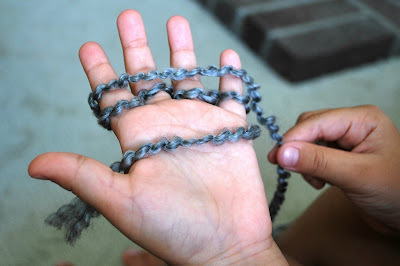 I taught finger knitting to my 3 kids last week. I have tons of left-over yarn and materials from testing out my new drum carders and floor looms that I can't use them all on my own. My kids then asked me if they can knit some too, so I thought them finger knitting! It's a really a fun family activity for us. Thank you for the great tutorial! your blogs are so informative where we get lots of information on any topic. Nice job keep it up!! 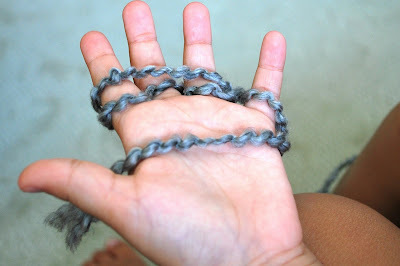 Thanks for sharing ,I just taught my daughter today to finger knit with one finger. Interessant! Jeg bliver nødt til at prøve din metode ud. God idé til bogmærker. 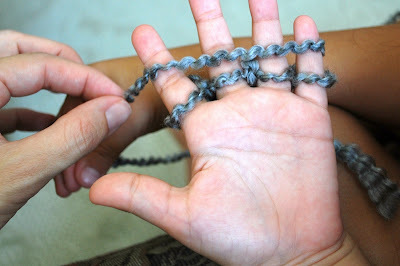 wow. . .really nice procedure on finger knitting. . thanks for sharing it to us ,. .. really great job. . . cool . . post. . . Thanks for sharing this great blog. I got a lot from reading it! Keep on sharing great posts! You’ve Succeeded in making this topic easily understandable, interesting and easy to read. to check out new stuff you post nice post, thanks for sharing. the information you provide on this website has helped me greatly. Thanks for all of your time & work. Adornment artists tend to get very creative. This post is highly informative. I recently came across your. Please send me mail if your are going to improve something advance.. Thanks..
WOW.. Its a great information about Buy medicine or Drugs... great article... keep working on it.. thanks for it. Very interesting stuff you have posted here. Keep sharing more informative stuff like that. Keep sharing more informative stuff like that. Very nice website. I found it accidentally but I like it. Lots of thanks for another valuable post. Its an informative topic. I am much impressed by your post..
Great tutorials you highlight here. So lovely pictures.. Loved it all.. I admire the precious time and effort you put into it, especially into interesting articles you share here! It was very interesting..
All of the contents you mentioned in post is just too good that will be extremely helpful. I’ll ensure that is stays under consideration, thanks for sharing the details keep updating, impatient for more posts. That is very good comment you shared.Thank you so much that for you shared those things with us.Im wishing you to carry on with ur achivments. i would like to thank you for the good read i had..
It’s really very interesting post. The key part of this post is its descriptive way to define anything. I liked it with my heart. This post is a excellent example of such kind of story. Finger knitting must be tiring job to do. Thank you for another great post. I’ve a presentation next week, and I am on the search for such information.And you are working a great job who increasing my knowledge. Thank you for the information that provided..
You are quite impressive i must say. In my opinion, the blog is really wonderful. simply great thanks for sharing this artistic post ! It is a very informative and useful post Then again, there are things we don't understand. really I would like to say thanks very much for sharing this amazing blog post. What a fun idea!! I remember doing something similar as a kid, but that was waaaay too long ago to remember details!! lol My 5-year old wants to sew with me, she does play around with embroidery and a ball-point needle but only when I'm RIGHT THERE next to her, lol. I think she would totally dig this! Thanks for sharing! Hi... I read your post and I want to say that it is very good and informative. I like it and I appreciate you for your effort. Thanks for sharing informative post.. It's a big problem for me.. But when i read this post.. It's become a solution of my problem.. I am very thankful to share this blog.. I hope you have more information about this blog.. So, Please share me.. Thanks.. Interesting blog !!! i love to see it, when people need such type of site. which has great information about this topic... Great for new generation.. Thanks Jamie for this tutorial. Interesting! I will have to try your method out. Thank you for a brilliant tutorial. I love it. Thanks for this tutorial. I will have to try your method out. Thanks Jamie for this tutorial. Interesting! This is a really fun way of spending your time with your kids. This bonding moment of teaching your little ones will definitely keep your bond stronger. Hope to see more tutorials from you like coasters or rugs that are very cozy. This is just so cool. Kids will truly enjoy doing this kind of stuff. It proved to be very helpful to me and I am sure to all the commenter here! I tried the same with yarn. Amazing tutorial for Finger Knitting.I appreciate the your great thinking.landing page designer. I have seen Cara Mengecilkan Perut Buncit your awareness Cara Menguruskan Badan Dengan Cepat about this theme Turun Berat Badan once you publish it and it really Cara Menurunkan Berat Badan Dengan Cepat provides an informational message to us readers. Thanks for sharing this information. I really like your way of expressing the opinions and sharing the information. It is good to move as chance bring new things in life, paves the way for advancement. I have read a lot of article of this web site by which many of them were being very interesting and uplifting. This information has excellent subject along with excellent description. I am really enjoying with your post. Thanks for sharing useful information. thank u for the good post, Some good observations. I learned so quickly. I love it. Great post! 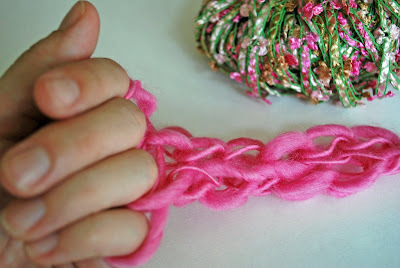 Accidentally I found this blog, this is very interesting blog,now i got to know how easy and interesting to make finger knitting. Thanks admin. Website Designing Bangalore ensures the client needs and wants in regard to the product with an individualized approach. Ecommerce Development Bangalore has enhanced an easy-to-use and evident feature which thereafter benefits the customer to effortlessly end their transaction…. Really excellent work you have post here i love your stuff. Awesome Post Write it up. This is so useful and informative for me. Living Room Ideas hey what a nice site . your blog is great . Wonderful post i have got here Thanks a lot for sharing. Jootoor Designs is a leading outsourcing company based out of Bangalore, Karnataka. Providing quality services on graphic design, website design and development, search engine optimization and many other web and graphic based services at affordable rate. This is a very useful post, I was looking for this info. thanks for sharing the great ideas. Thanks for sharing a very interesting article about Finger Knitting. This is very useful information for online blog review readers. Keep it up such a nice posting like this.